I didn’t have a big budget to spend on creating the space. We painted the outside ourselves and I simply varnished the floor and white washed the walls. I already had much of the furniture, such as the vintage desk, retro office chair and old French leather club chair but I mixed these pieces with practical and affordable office furniture from Ikea. 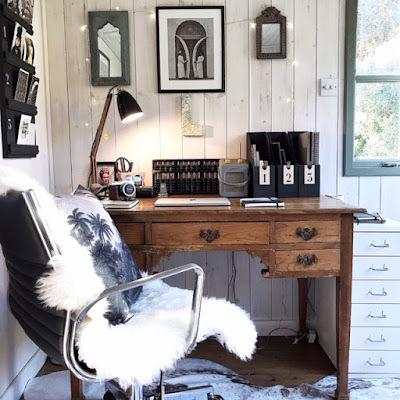 I then added the finishing touches; such as a cow hide rug, cushions, plants, pictures and vintage finds sourced from antique fairs to make it feel homely and cosy. Well worth a quick look.